Welcome to this fascinating event known as Kuta Karnival in Bali, Indonesia. The Kuta Karnival event will be starting from October 2016 on the glorious Kuta beach in Bali. The previous edition of this event has witnessed large number of tourists from round the globe in Bali. 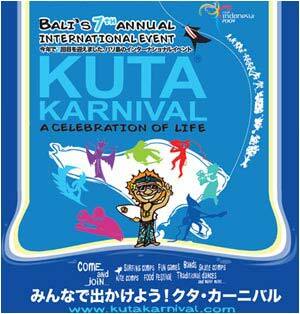 This years Kuta Karnival promises more fun and excitement on the beaches of Kuta, Bali. There will be series of event like opening ceremony with Kite Festival, Balinese Arts, Cartoon exhibitions, Movie Screening, Bali Food Festival, Sand Sculpture Competition and lots more. Kuta Karnival Bali Food Festival – As a part of Kuta Karnival 2016, Bali Food Festival will also be held in this mega event. All those who loves cuisines or recipes can take part in this mega food event in Kuta region. There will be lot of people joining this food festival to present there culinary skills. Apart from delicious food stalls, there will be movie screening, DJ session, children playground and lot of other entertainment activities. So don’t miss this Bali Food Festival at Kuta Karnival 2016.